Hello and welcome to Southwind Longhorns! Our ranch is located 5 miles northeast of downtown Ben Wheeler, TX. 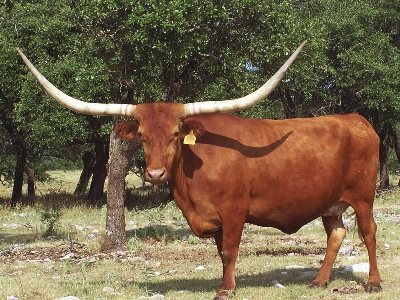 We have been raising longhorns since 2010. What started out as a low maintenance tax exemption has now turned into a passion. Our family fell in love with the breed's color variation, maternal instincts and beautiful twisty horns. We have finally gotten to the point that we have a forward progressing herd worthy of investing into our own website. Our learnings over the past years have led us into purchasing several proven horn producing cows and we have been leveraging artificial insemination and IVF embryo flushes to accelerate the quality of the offspring in our program. Our program tends to favor a larger cow, with a proven horn pedigree and the ability to throw color. We were fortunate in being able to buy the original 85" T2T Working Woman cow at the Mosser dispersal sale and the 81" T2T Mi Tierra I66 cow from the Mi Tierra Longhorn Ranch in Joplin, MO. Our herd will feature these genetics moving forward along with the use of proven A.I. Herd Sires. Thank you for visiting our website and please come see us when you are in east Texas.